This Bologna food experiences roundup was produced in collaboration with Emilia Romagna Tourism and Bologna Welcome, who hosted me during their Blogville campaign. I hope you enjoy every tasty word! My dear hungry hungry hippos, while it’s possible that you’ve never heard of Emilia Romagna, Italy, I can guarantee you’ve tasted it at some point in your lucky life. Whether showering your meal with a mountain of parmesan, drizzling your salad with sweet balsamic vinegar or popping tortellinis by the dozen, some of Italy’s most beloved foods do in fact trace their roots to this delicious Italian region, which is often hailed as the gastronomic center of Italy itself. And Bologna? Well let’s just say there’s never any shortage of amazing eats in Bologna. I mean, ask a local where to eat and the result is invariably frustrating. “Where do you get the best tagliatelle al ragù in the city?” a hungry investigator might ask. In most places, the standard reply would be an actual answer. In Bologna however, such a question incites spiralings of existential contemplation. Straight answers are near impossible, or perhaps worse, they’ll say something dramatically unhelpful like “you can’t beat my nonna’s”. And after spending a week in Bologna, I get it. It turns out finding the best Bologna food to devour comes down to more than just an address. It’s about crafting the perfect mix of happenstance, good company, tasty flavours and good old experience. In fact, ask me now about my best meal in Bologna and my eyes will likely cloud over as dreamy harps begin to play… and I talk you through a 45 minute story that doesn’t answer the question at all. But fret not! I’ll save that narcissism for another day. If you’re a visitor eager to crack into the Bologna food scene, allow me to help you out. 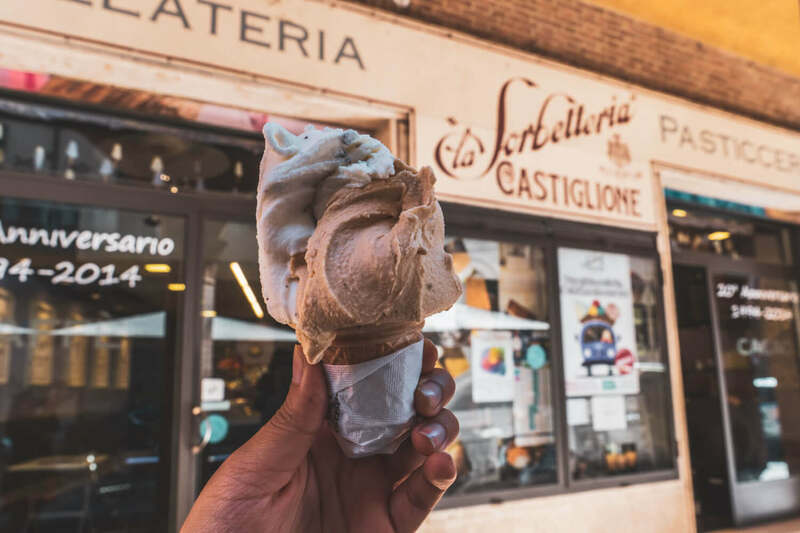 Here is a list of the top food experiences you need to try on your next Bologna trip, from slurping up lusciously whipped gelato to assaulting your senses at the city’s best markets. First – What is Bologna, Italy known for? Before we dive into the many Bologna food experiences you can test out, let’s discuss the classics that Bologna is known for. Now, I wish I could tell you I sampled a wide range of different dishes in Bologna when I had a chance, but this is thoroughly untrue. Instead, I stuffed my gall with the most clichéd of classics, which I insist are clichés for a reason. And so, if you’re wondering what to eat in Bologna, here are just a few classic Bologna food items you need to cram in during your visit. Mortadella: A fatty Italian pork sausage flavoured with various spices and pistachios, typically served in thin slices or in cubes. This is what we in North America have come to know as “bologna” or “baloney”. It’s hard for me to describe the real deal – it honestly has a really similar flavour to the bologna I used to eat as a kid (and trust me when I say I was addicted to the stuff). The difference for me though is the texture. Real mortadella has more of a “melt in your mouth” feel that is brilliantly delicious and addictive. I used to wonder often as a child “what is bologna?” and now I know: it’s a sad version of delicious Mortadella… once you’ve had it, you won’t be able to go back! Tagliatelle al Ragù: Wide egg noodles tossed in a meat-packed tomato sauce (simmered to perfection with red wine, carrots, celery and onions). This is the local (original!!) version of what we in North America have adapted to become spaghetti bolognese. Make no mistake, you won’t find any spaghetti bolognese on menus here. Tagliatelle is a much better noodle suited for sopping up the delicious meaty sauce. I must confess, I’m so in love with tagliatelle al ragu, I wish I could bathe in it. Lasagne Verdi alla bolognese: Lasagne is a food that requires no introduction, but the traditional bolognese style of lasagne is a true game-changer with two decadent sauces (a bechamel white sauce, and a meaty ragù) coming together alongside cheese and spinach flavoured pasta (which gives the noodles a green colour). Thanks to the green tint, I like to pretend this dish is good for me. 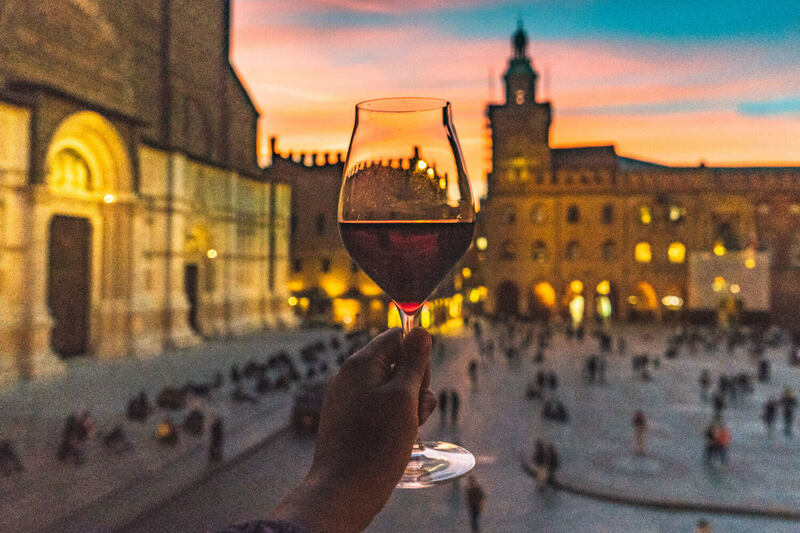 Lambrusco: Whether knocked back as an aperitivo or simply as a treat after a long day of sightseeing, make sure you grab a glass of refreshing Lambrusco, a fizzy red wine from the Emilia Romagna region that pairs wonderfully with…. well, anything, really. Pignoletto: And on the topic of fizz, it’s obligatory that you try a Pignoletto, a fizzy white wine that gives prosecco a run for its money. Tigelle: Forgive this thoroughly Canadian description, but Tigelle are like doughey hockey pucks made of bread, best served warm and cripsy with a healthy heap of cold cuts. Also sometimes known as crescentine. Gelato: You’re probably no stranger to gelato, but trust me when I say the gelato in Bologna might just change your life. Between the inventive flavours, dreamy creamy textures and more attention to quality and taste than presentation (as evidenced by the lidded metal tins that shield most concoctions from sight – better for keeping the gelato at the right temperature! ), the gelato in Bologna was some of the best I’ve ever tried. That said, make sure you get your hands on some (more details on this below). Alrighty then – it goes without saying that you need to try all of the above when you find yourself in Bologna, but what else? Well, as I said before, food in Bologna is meant to be experienced. The next section details my favourite Bologna food experiences you need to try! 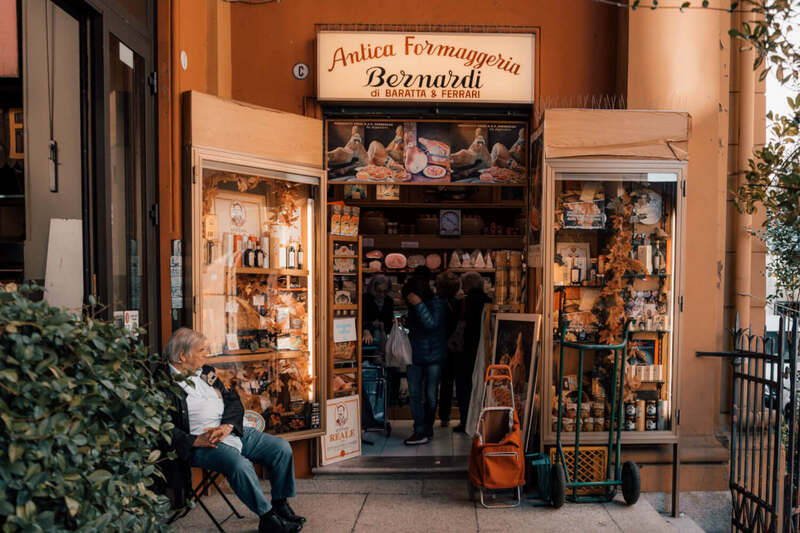 Truly, there is no better way to acquaint oneself with the foodie culture of Bologna than to visit a Bologna food market, where you’ll find decadent displays of fresh produce, giant cheese wheels, handmade pasta and all sorts of local delicacies to drool over. 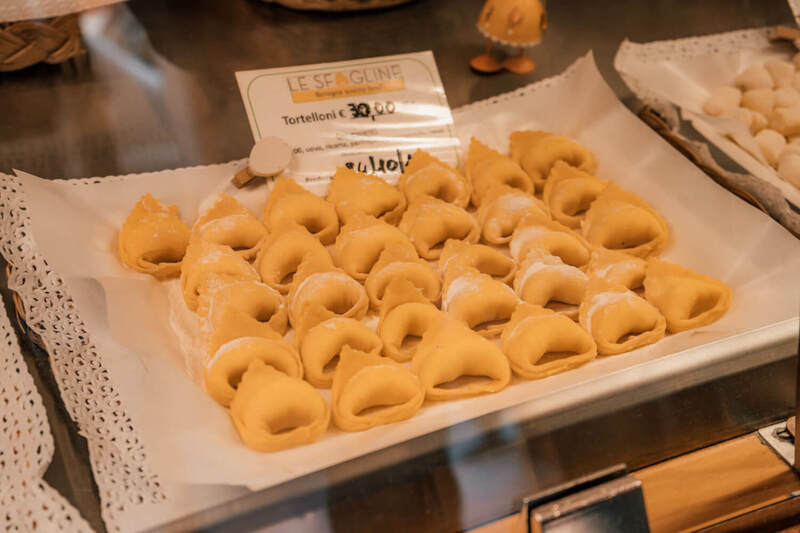 There are all kinds of markets scattered around Bologna designed to tantalize locals and visitors alike, so make sure to throw your money at this wonderful Bolognese experience. Mercato delle Erbe: This is the largest covered market in Bologna’s center, and much less touristy than the more popular Quadrilatero. We came here in the morning with our Taste Bologna tour and it was such a pleasant little stop. Granted, the many stalls here (selling produce, meats, cheeses and other local products) are not as photogenic as the gorgeous displays of the Quadrilatero, but it feels much more relaxed, local and authentic. If your idea of a good time is waddling along tiny nonnas picking up their groceries for the day, this is a must-visit! The Quadrilatero: The most popular and most touristic Bologna food market is hands down the Quadrilatero, the old market of the city, comprised of a delicious network of narrow streets just off of Piazza Maggiore. 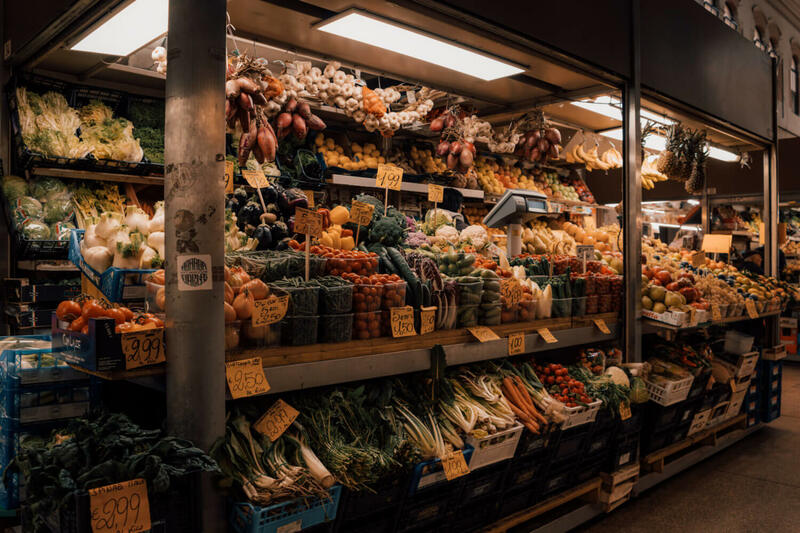 By day, you’ll find bustling stalls crammed with all sorts of local delicacies like juicy produce, fresh pasta, fluffy bread, and more. Then by night, even as shops shutter their doors for shopping, the party spills out onto the streets, with happy customers munching on all sorts of deliciousness for aperitivo and dinner. NOTE: given its central touristic location, you’ll definitely pay a premium for goodies here, but it’s still worth a visit. Mercato di Mezzo: When hunger calls, do as the locals do and swing by Mercato di Mezzo, a little covered food hall in the Quadrilatero that was newly renovated and re-opened in 2014 with three stories of stalls selling everything from traditional pizzas to artisan beers. While it’s a favourite among locals and visitors for a quick bite, I found it to have a commercial (rather than cozy) feel. Still worth a quick perusal though! Mercato Ritrovato (formerly Mercato della Terra): Lastly, while I didn’t get a chance to visit this weekly farmer’s market in Bologna for myself, this enthusiastic description from the foodie experts at Taste Bologna have convinced me that I need to add it to my list! Whether you’re itching to mingle with local producers, buy farm-direct produce, indulge in some street food or groove to live music, this is a local Bologna market you need on your list. Having endured the severe hardship of post-Bologna food withdrawal, I can prescribe a simple remedy for this excruciating first world problem. Take a Bologna cooking class, and you can continue to gain weight from the comfort of your own home! We enjoyed a class with Bologna Cucina, which walked us through the process of creating pasta dough from scratch, granting us a base for three delicious dishes: a dreamy tagliatelle al ragu, with a rich sauce simmered to perfection before our very own eyes, mangled packets of tortellini that were delicious, but tough to get in the perfect shape for us newbies, and of course, a delicious tortelloni filled with a cheesy ricotta and drizzled with a butter and sage suace. That’s right – after this simple class, I walked out with three of Bologna’s best dishes under my belt (which needed to be loosened five notches) and an inflated sense of self-worth. Thanks, Bologna Cucina! BONUS WARNING: Ttaking this class may lead to a jerkish insistence on making pasta from scratch, and often telling strangers about it. Congratulations, you’re now an insufferable pasta douche. As I mentioned earlier, one is really spoiled for choice when it comes to enjoying delicious food in Bologna… and sometimes, the choice is paralyzing. 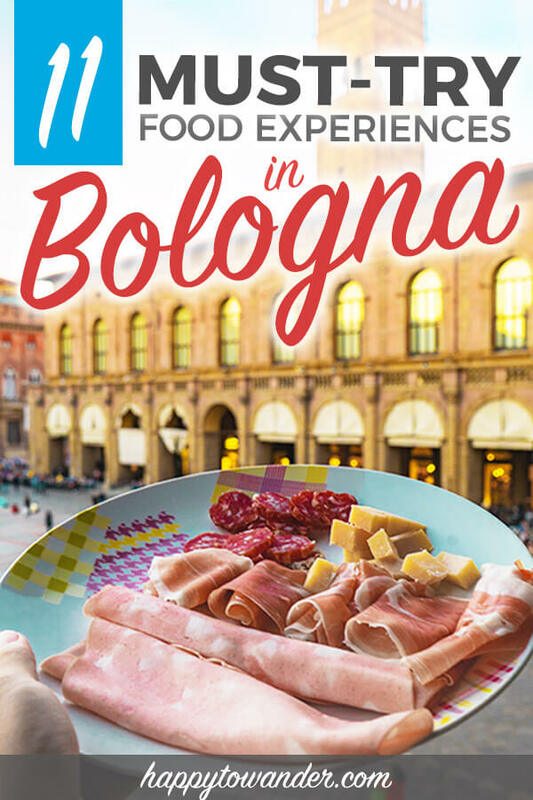 During my trip, I enjoyed an abridged version of the Taste Bologna food tour before our cooking class and it was wonderful! I’d highly recommend booking this experience. They keep groups small – no more than 8 folks per group, which means it’s a really lovely and intimate experience as they bring you to a variety of cafes, restaurants, markets and more, but don’t just take my word for it – they’ve also been featured on BBC and Netflix original, Somebody Feed Phil. If there’s one thing I wish the entire world would adopt, it’s the Italian art of aperitivo. Basically, aperitivo is the gorgeous past-time of whetting your appetite before dinner with some booze and snacks on the house. It’s a popular thing to do all over Italy, but you can expect an especially wonderful time doing so in the gastronomic hotspot of Bologna. This glorious “happy hour” which takes place in the early hours of the evening works like this: you order a drink, and then get access to some free nibbles, whether that’s simply some chips and bruschetta brought to the table, or a giant buffet spread that’s free for your faceplanting. The variety in choice of aperitivo spots around Bologna is equal parts exciting and agonizing. I went to a few spots (including a DIY aperitivo which was my personal favourite, pictured below) but didn’t fall head over heels with any particular place, so here is a great list from Delightfully Italy of local aperitivo spots in Bologna. Another great Bologna food experience that’s easy on the wallet? Cooking your own meal at home! Of course, this experience is only possible if you are renting an apartment in Bologna or otherwise have access to a kitchen, but one of the coolest Bologna food experiences you can have (and most memorable for sure) is going out and collecting all the ingredients for your own wonderful Bolognese meal. 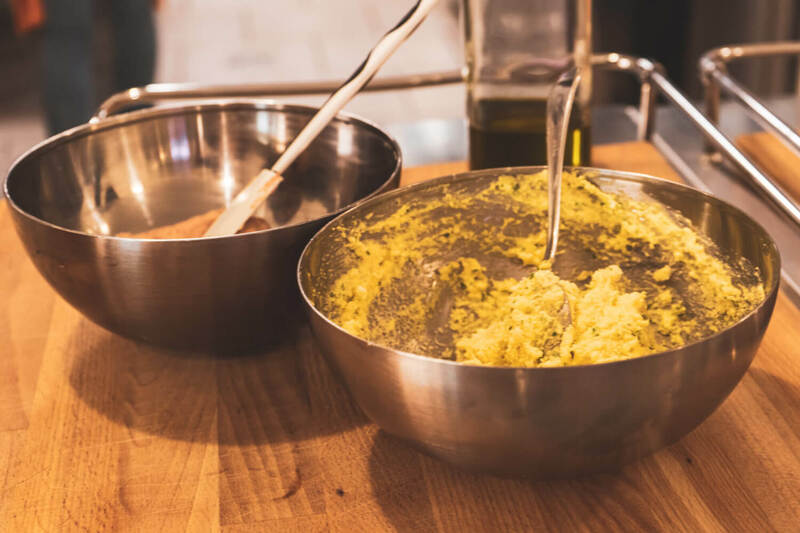 Something about choosing a recipe, shopping for the ingredients, and mixing everything up while enjoying a glass of vino… ahh – it’s a magical “I’m really in Bologna!” experience you can’t miss. Want to cook something really easy? I suggest you grab some fresh pasta from either Le Sfolgine or Sfoglia Rina, then make your own sauce with ample bottles of wine and cold cuts to enjoy while prepping. This is probably the simplest way to make your own incredible meal… and is fairly foolproof. If all else fails though, just drink your wine until you start seeing Michelin stars. That should do it. As I previously alluded to, I am straight-up obsessed with the gelato in Bologna. My absolute favourite. I love everything about this place! Its discrete location tucked away in a portico, its business cards which fold up like gelato cones (yes, really!) and its decadently creamy gelato creations that are so indulgent, they’re a guilty pleasure with every lick. My recommendation? The cremino pistachio. It’s super rich, but delicious. Creamy, smooth and just wonderfully tasty concoctions in a cute purple-walled shop. My recommendation is the salted caramel – it was unreal. Plus, the storefront makes for an excellently cliched IG photo opp. Ask any local where their favourite gelateria is, and inevitably Santo Stefano will come up. No doubt, this is one of the most popular gelaterias in the city, and for good reason: it has all the cuteness and daintiness of a French patisserie but with unique and inventive flavours. You can’t go wrong with testing out the flavour of the month. This little hole-in-the wall gelateria is frequently hailed as one of the most delicious in the entire city, plus it allows you to indulge in good conscience 😉 Ingredients used at Galliera 49 are not only organic and fair trade, but also free of preservatives, artificial colours and hydrogenated fats. And while this wasn’t my tastiest gelato in Bologna, countless rave reviews lead me to believe I simply ordered poorly – this shop is best known for their fruity flavours and granita. It’s time to set those fancy non-dessert degrees on fire because just outside of Bologna in Anzola dell’Emilia, there is the opportunity to attend a university…. of gelato! 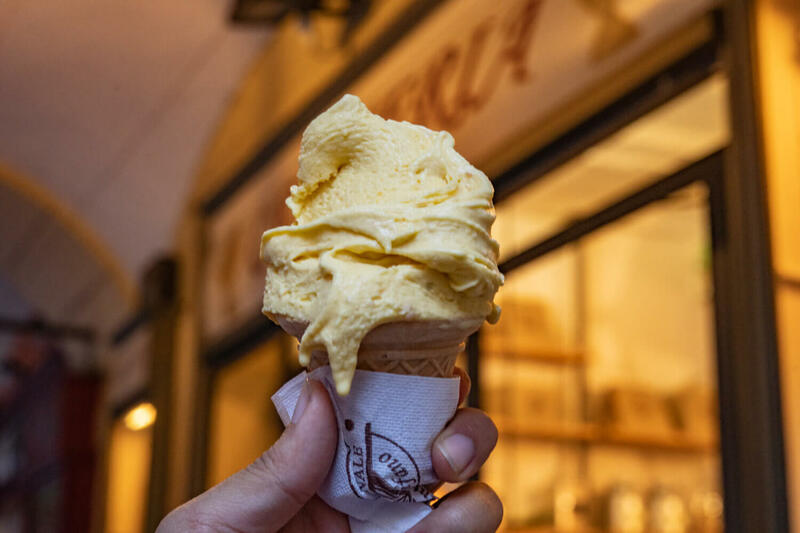 Set up in 2003 by famous gelato maker Carpigiani, this university offers over 500 courses for gelato enthusiasts and entrepreneurs alike, ranging from short-term programs lasting mere days, to longer ones that span for weeks. The end goal is of course to impart endless wisdom on the art and science of gelato, and to equip graduates with the skills they need to create delicious gelato (and successful gelato businesses) around the world. So, why not solidify your love for Italy’s best known treat with a swishy little diploma? I realize that “hipster” and Bologna are two words that don’t usually go together, but Via del Protello is a buzzing street in Bologna which has earned this hipster title, no doubt thanks to its popularity among the young and cool. Although to be fair, I would say Via del Protello isn’t really hipster, it’s just popular… with everyone! By day, it’s a sleepy place scattered with spots to grab a bite to eat or perhaps admire the rogue graffiti murals that have been painted on closed shutters. By night however – it’s crowded with clusters of people out to wine and dine and be merry. Many locals consider Via del Protello to be a hub of Bolognese social life, so it’d be silly for you to not join in on the fun. One of my favourite things that I did during my time in Bologna was visiting local producers of Emilia Romagna’s most beloved creations: namely balsamic vinegar, parmiggiano reggiano cheese and prosciutto. Trust me when I say these visits will change the way you look at and enjoy your food. After all, when you realize the literal years that go into producing that crumbly wheel of parmesan cheese you stuff in your face, you start to appreciate every bite like it’s the most beautiful thing in the entire universe. Enjoy your tear-drenched parmesan, my friends. Anyways, besides turning you into an emotional food-driven mess, this particular Bologna food experience is one that allows you to capture the holy grail of “authentic” travel: connecting with locals! Chatting with the producers (even with a translator mediating) is a great way to develop a stronger understanding of Emilia Romagna’s food culture, and is a worthwhile experience I highly recommend. For reference, our tour brought us to the Salumificio Gianferrari, the Latteria Campola and the Agriturismo Cavazzone. 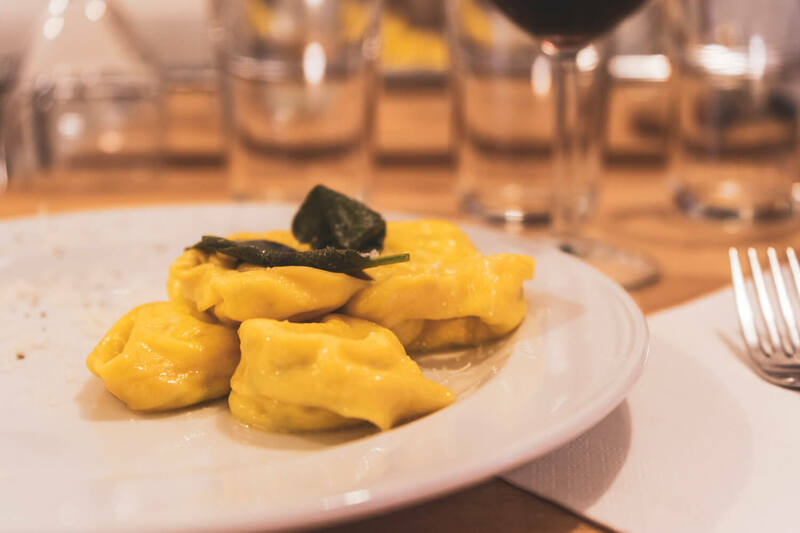 Fall was an amazing time to be in Italy, not just because of the pretty foliage and crisp autumn air, but because it’s a great season for festivals (or sagra)… especially food-related ones. While the theme of these festivals can depend, one thing remains consistent: you get an awesome opportunity to learn about a beloved delicacy, alongside the chance to buy and gorge to your heart’s content. My time in Bologna coincided with the Mortadella Bò, a festival celebration of mortadella which involved plenty of merriment, including cooking classes, demos, tastings, and even the slicing a giant mortadella in Piazza Maggiore, a sight which I am honestly devastated to have missed. There was also a white truffle festival nearby in Sant’Agata Feltria that we were meant to attend, but sadly rain spoiled those plans. Elsewhere close to Bologna in the Fall, you can find a Balsamic Vinegar festival in Spilamberto, an olive oil festival in Brisighella and a fish festival in Cesenatico… just to name a few. If your visit coincides with a local food festival, make sure you take advantage! 11. Visit FICO Eataly World…. maybe? Last but not least, we have FICO Eataly World. There’s no way to dance around this – FICO Eataly World is a veeeery contentious attraction in Bologna. 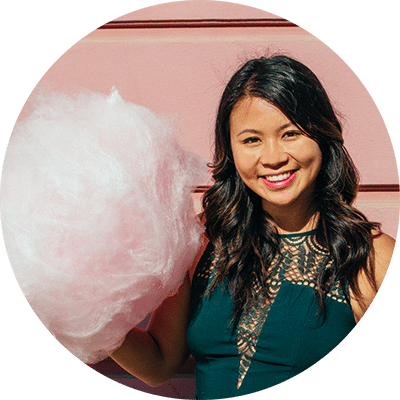 You might have heard of it a few months ago when there was a massive media frenzy about how it was “the world’s largest food amusement park” and a magical “Disneyworld for foodies”. Because of the hype, I, too, was really excited to visit for myself… a dream that was quickly squashed upon arrival. It seems locals don’t love the attraction. At best, they see it as a mere opportunity for tourists to get acquainted with Italy’s diverse food culture (but would never personally visit). At worst, they see it as a commercial and touristy abomination of the country’s gastronomy. So me? I didn’t end up going. BUT I have heard from friends who have visited that it’s great fun so long as you go in with the right expectations, that it’s a touristy place more reminiscent of an American mega-mall than the local, family-owned quaintness of a traditional Italian market experience. But for foodies? It very much is a playground, and you’ll be hard pressed to find a place with this much variety and choice in just one stop. With over 100,000 square metres of vendors, it’s so huge, you can even rent bikes to navigate it. So, is a visit to FICO Eataly World worth it? It depends on what you’re looking for, but know that it’s very much made-for-tourists, and a commercialized version of the Italian food shopping experience. 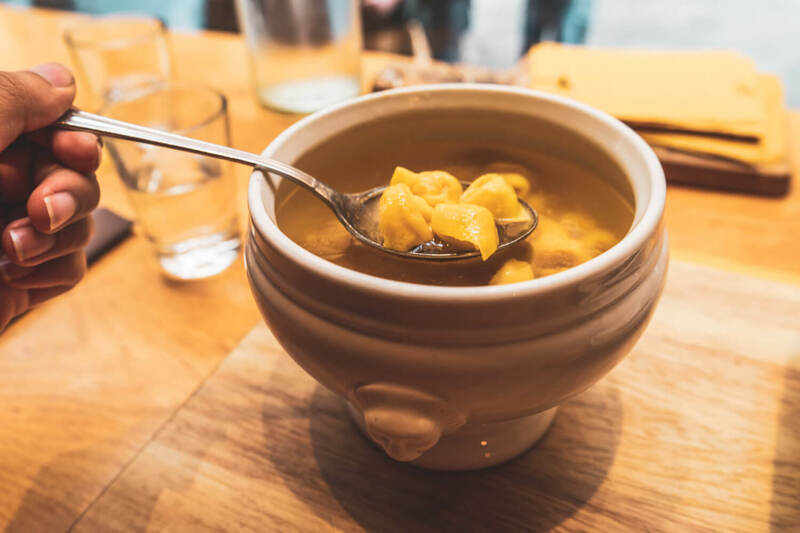 And so, if you feel adequately tempted by this roundup of Bologna food experiences and you’re itching to book your own tasty getaway, here is some practical information about Bologna for you. Cheap flights to Bologna are abundant thanks to the operation of various budget airlines in the city. I would recommend using Skyscanner to find the cheapest flight deals from where you are. Alternatively, if you’re located in Europe already, it might be more cost-effective to take a train or bus. In that case, I would use GoEuro to compare your different options for free. Wondering where to stay in Bologna? While we stayed in a gorgeous apartment overlooking Piazza Maggiore, there are a lot of great hotels to choose from in the city. Bologna is extremely walkable so I would recommend you stay somewhere a little quieter so you can get a good night’s rest. Bologna nightlife is pretty buzzing so if you stay in a very popular area like us, you do risk being unable to sleep due to loud crowds. Click here to browse the best deals on hotels in Bologna’s city center. Any more questions or recommendations for Bologna food experiences? Hopefully any questions you previously had about what to eat in Bologna are now answered, but if you have any more questions, feel free to fire them off below! Or feel free to chime in if you have your own recommendations as well. Buon appetito! Holy cannoli – I can just see it now, sitting in stretchy pants, giant sunglasses with mounds of pasta ready for me to devour! I think Italy must be the mecca of delicious food. One of my biggest takeaways was chicken and pasta is a cardinal sin HAHA. Hold up. Hold up. There’s a Gelato University? Where on Earth was this when I graduated high school? Could’ve saved me from picking all the useless other courses I was doing. This post actually killed me (in the best of ways) because I am fiending for Tortellini, Bolognese and Gelato now and I don’t know what to do about it because I’m on the other side of the planet. Okay, clearly I did something wrong when I visited Bologne. Oh, I did spend a day or two hunting down spaghetti bolognese (whoops! ), and I tasted many varieties of gelato, but it looks like I need a return trip to find the real food gems in this city! Gelato University sounds amazing! One of our fathers at Christ University, Bangalore actually visited Bologna, learnt the art of cheese making and started the trend in the city 🙂 We purchase that prosciutto to make the weekend pizza parties!